Years ago, you would not find me camping or hiking outdoors. I've always wanted to explore the outdoors more, but it was never something that I pursue actively. I didn't have the people to go with nor the proper gear to survive in the wilderness. And honestly, my priorities and interests were very different in my early twenties. Fast forward to today, I have camped, backpacked, hiked, and am always planning my next outdoor adventure. 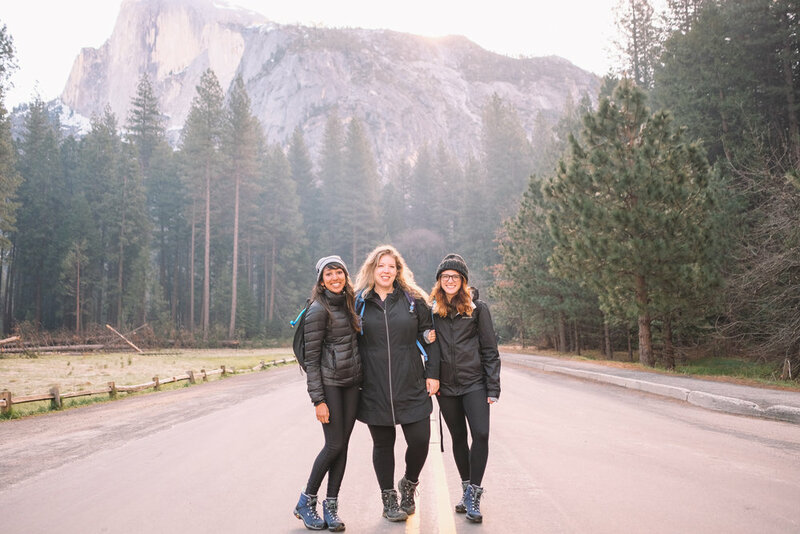 Yosemite National Park is probably one of my favorite places, and I got to visit it again earlier this month with some amazing girlfriends I met through Instagram, Aimee, Brooke, and Shikha. Instagram has been an amazing social platform to meet and network with other creatives, and bringing that interaction beyond our smartphones and into real life is really something special. 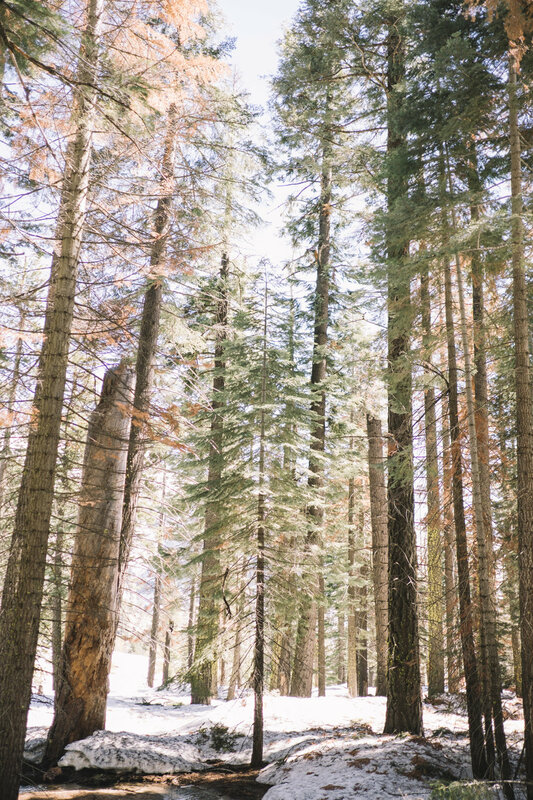 We spent the weekend completely off the grid due to no reception and no wifi, and we hiked, laughed, got to know each other, ate a lot of s'mores, and took a ton of photos! It's quality time like this that a lot of millennials are missing out on these days! One of the major reasons why I like being out in the wilderness so much is that it forces you to be detached from your phone, computer, and all that distracting technology! Try it sometimes, it's very therapeutic! Many of us city dwellers don't own a car, but not having a car shouldn't stop anyone from creating their own adventure! We got a super dope Jeep Wrangler that was perfect for our trip courtesy of Getaround, an online car sharing service where you can rent cars from others or rent out your car to others. The nice thing about Getaround is that you can search for the exact car you want, so if you have always wanted to drive a Tesla, well, you can rent it through Getaround! It was my first time driving a Jeep, and it was so much fun! It also looked so good in all the photos! Use my link here to get $20 off on your first rental. We checked into our tent cabin at the Half Dome Village friday night, and we got the heated cabin since it gets very cold at night. Staying at a tent cabin was nice because you get to be out in the nature while still having access to amenities to keep your stay comfortable. Saturday morning we woke up early to hike the Snow Creek Trail. This 10 mile hike was rather strenuous with 2700 ft gain in elevation, but we were up for the challenge! 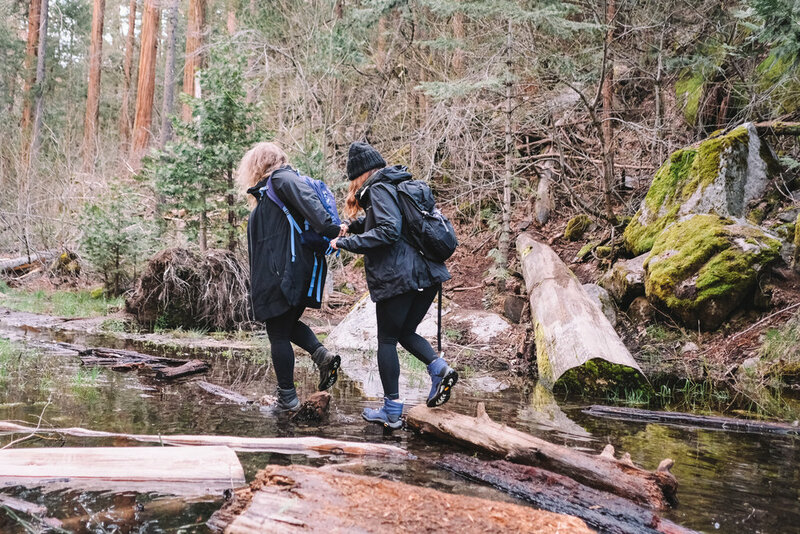 This trail also lived up to its name, melting snow created streams running through the majority of this trail, but thank goodness for our waterproof hiking boots from Ahnu, which kept our feet nice and dry the entire time. Also major thanks to Athleta for keeping us fashionable and functional during our hike. 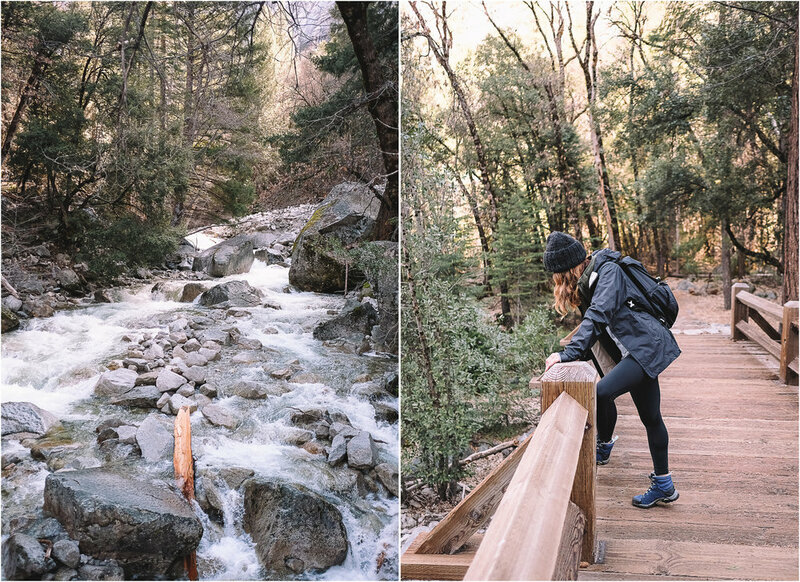 Stylish hiking clothes are hard to find, but Athleta has got you covered. 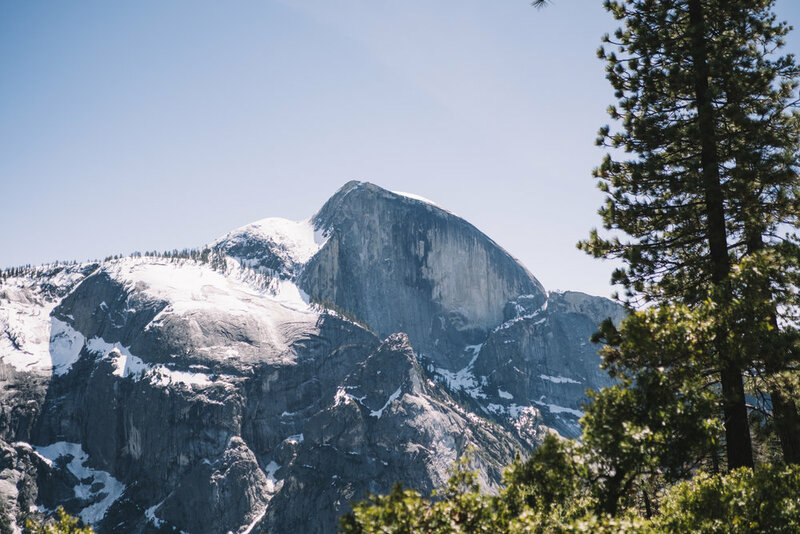 After what seemed like a never ending slew of switchbacks, we were finally rewarded with views of Half Dome at the top and lots and lots of snow! 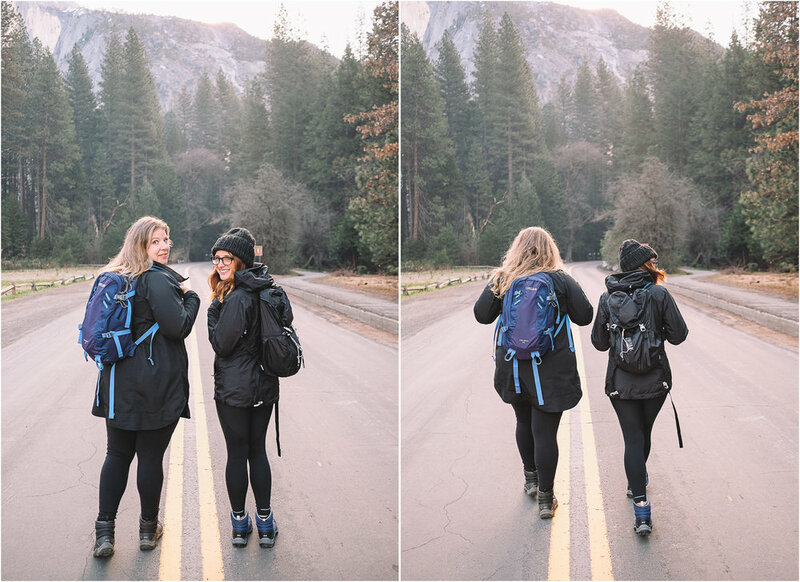 We felt so accomplished after an entire day of hiking that we had to reward ourselves with pizza and beer back at the Half Dome Village, but let's not forget about the dessert! We met up with some of my coworkers at a nearby campsite and set up a campfire to make s'mores. 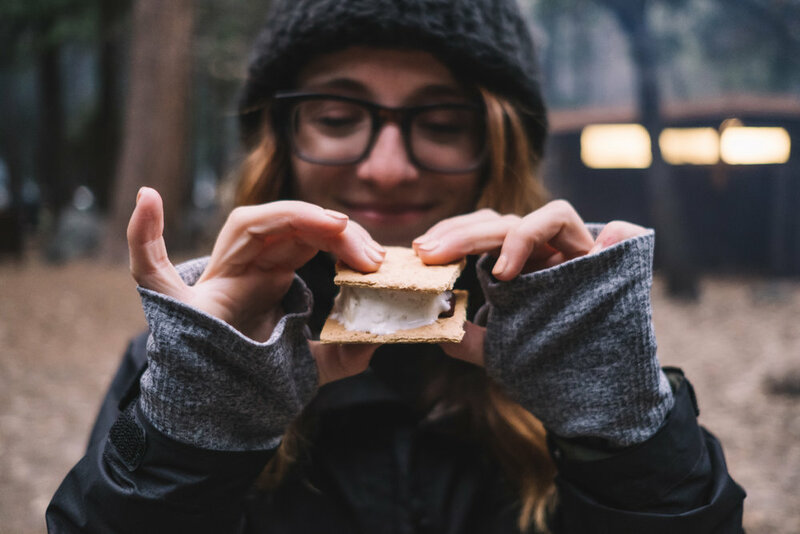 Seriously, sitting around the campfire and stuffing my face with s'mores is probably one of my favorite things about camping! Also our chocolate from Dandelion Chocolate totally elevated our s'mores game. So good!! We passed out early saturday night and woke up early sunday to catch that beautiful morning light for a photoshoot. Early in the morning and late in the afternoon are my favorite times of the day to shoot, the light is always soft and gorgeous, trust me, that morning light is worth waking up early for. After the photoshoot, we packed up our bags and got a head start back to the city to beat the traffic. What a memorable weekend in the outdoors with great company. Can't wait to to a trip like this again in the future! 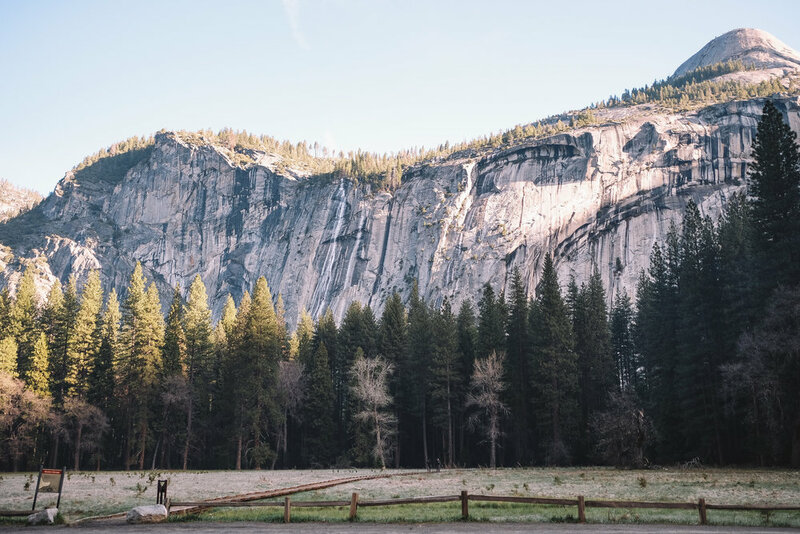 What are some of your favorite outdoor spots in California? I am always looking for recommendations!